In the wagon there is no space to sit. There are air holes running along the top of the train’s sides. Everyone has turned their face upwards in the hope of catching a fresh breeze. The train jolts and shakes but there is no space to fall. The only thing that is shoved around at their feet is the metal bucket. Initially no one uses it – after all, the journey should only take a couple of hours – but then the train halts for ages in open fields. The doors remain closed in case it begins to move again. First the children use the bucket, afterwards the men and eventually the women too, peeing into it while standing. To begin with Trude is still trying to think of what they will do once they reach Berlin. And she hopes they will return soon: she doesn’t want Albert coming home to an empty place. But even these thoughts eventually stop and all she wants is for them just to endure the journey. Every now and again she quietly asks, ‘Mum?’ Agatha replies with a ‘Hm.’ Peter is standing between the two women, his cheek against his mother’s stomach. Trude feels him breathing. A couple of times she nearly dozes off, but then with a start she regains consciousness. ‘Mum?’ ‘Hm.’ And she feels the breathing of her son. And so it was that Agatha, Trude and Peter became part of the 11 million Germans who were fleeing westward in the 75 winter of 1945. None of them knew where they were heading. But they all hoped to return home soon. Little did they know that the world was changing behind them and borders were being redrawn. Their homes now belonged to others and they were crossing into a foreign land. 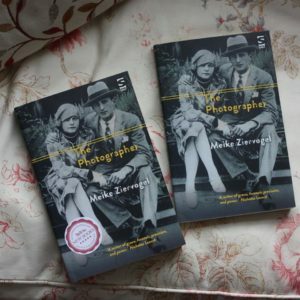 Meike Zeirvogel’s latest novel The Photographer is on the surface of it about Albert, his wife Trude, their son Peter and his mother-in-law Agatha, a seamstress. It is a quietly told tale which opens in 1920 but most of the action is set during the second world war. It revolves around this tiny family which is managing to live peacefully despite the raging war when suddenly Albert is picked up by the police and whisked away. For a while his wife Trude is mystified at his arrest and cannot understand what the matter is till she realises after seeing her ransacked home they were after the hidden radio. Albert and Trude used it to listen to music and dance every night. But to possess a radio during the war was considered a serious offence and Albert is taken away. Agatha had always disapproved of Trude’s marriage to Albert so had conspired to tell the local police. For a long time Trude is unable to fathom who let on to their little secret till she deduces it was her mother. The Photographer is a seemingly deceptive simple story but is also complicated for the many layers to it. The relationship between the mother and daughter is worse than any imprisonment. It is living with the horrible truth about the mother’s distaste for Albert with Trude caught between that is like a slow death. Ironically it is the wisdom of the mother ( and her savings) that leads Trude and Peter to safety. The saving grace in the hostile environment of the family is Peter who is loved by all the adults in their own way and for whom they will do anything. Meanwhile Peter too has to figure out a way of surviving particularly when his father returns home with his own archaic expectations of how a young boy should behave. Later while setting up a business that slowly begins to flourish Agatha persuades Trude to join her as a seamstress. Like with any conflict the second world war too was disruptive especially for the family. If people were fortunate to survive they did so with many hidden scars and learned to exist with new arrangements to their established relationships. There were subtle shifts and these hard-to-define transformations that occurred in families is exactly the grey area which Meike Zeirvogel explores. The war torn landscape may be a useful backdrop to the story providing immediate explanations for changing family dynamics. But at another level the war and the changing borders can function as a metaphor for the fluid changes that are constantly happening within a family unit at any point of time — like a slow dance. As Albert discovered as a professional photographer “Taking photographs of families is pretty straightforward – they all look the same, want to look the same.” And yet it is not. Curiously this slim book lingers in one’s imagination long after one is done with it. The Photographer is published by Salt Publishing, 2017.